I like to come here and work during the day. It's very quiet and the barrista is very friendly. Good beverages too! Always a good place to bring your laptop and get some work done. The wifi is consistently good, and they have snacks and pastries on hand to keep you happy. It's a much better cafe than the night club it becomes after-hours. Friendly and comfortable atmosphere to get work done. There is free wi-fi and a few places to plug in and you can stay as long as you like, no one bothers you to leave or buy more. The two girls who barista are really nice and helpful. I definitely recommend this place to anyone who needs a nice quiet place to work. peach iced tea, choc/banana bread, loveliest staff - housed in a gorgeous building from 1857. Yes, there is great wifi, some might prefer to sit on the front patio and observe the various characters of 1st st. Watch for the woman that likes to steal the roses from the planters, OR listen for the guy riding his tricycle cursing his ex-lover for all to hear. You can also learn various facts and figures by inquiring about the NYT crossword of the day. The baristas love information in all forms. 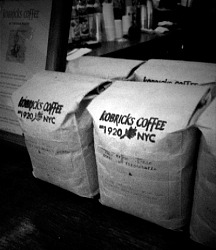 I buy the Kobricks coffee by the pound, very fresh and tastes like the pacific northwest. I have been a cafe-girl since college, spending copious amounts of time sitting, sipping, chatting, reading in my favorite local spot. I am fiercely loyal to whichever place I find that fits my needs--Arlo and Esme has got me covered. I have been coming here everyday, almost without fail, for over a year. You wont find a friendlier, more comfortable place to meet friends, or to work, or to read, or to chat. Free wifi, plugs, beautiful, homey interior, and the baristas will treat you like a friend from the first time you enter; you can do the crossword puzzle with them, you can try the drink recipes with which they are experimenting, you can discuss the newspaper with the person sitting next to you. You will always get a seat--it is never crowded. The coffee is great, the banana-nut chocolate bread is to die for, and always fresh, and the music they play just kills it. Go. Spend the day--you can leave and come back, even, if you want. Arlo provides you with all that you need--and either no one will hassle you or everyone will chat with you, depending on what you want.